Walking across America are Devin Gagliardi, 27, of Flint, Mich., Edward Riley III, 23, who grew up in Louisiana and Neptune City resident Joseph McDowell, 25. 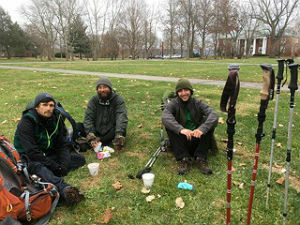 Joseph “Joey” McDowell of Neptune City and his buddy, Edward Riley III, 23 of Louisiana are walking across America. The two, known by their trail names Biscuit and Green Beans, figure it will take them about a year. They began their odyssey in September. When her stepson first told her about the trip she was skeptical. The two met at a weekend concert/festival in Georgia in 2015, where they were on adjacent campsites. As the weekend progressed, they became instant friends, and became best friends over the next several months as they kept in contact online, texting, etc. They also found a common goal: An adventure … a tough one at that. The two are hiking across the country – east to west — on the American Discovery Trail, which starts in Cape Henlopen, Del., and ends in San Francisco. They left the day after Labor Day, and they don’t expect to be home for at least a year. It’s a long trek … they plan to backpack the entire distance through all kinds of weather, through several states, and they already are building a cache of great stories, meeting incredible people, and appreciating the benefit of the kindness of strangers. Those nicknames? When they were at the festival, a girl was walking around with a huge bag of fresh green beans, and handing them out to every concert-goer she saw, saying, “Green bean?” The two thought that was hilarious, so McDowell started calling Riley “Green Beans.” The nickname “Biscuit” for McDowell was likely retaliation. McDowell grew up in Neptune City, went to Woodrow Wilson Elementary School in Neptune City and Red Bank Regional, Little Silver, Class of 2009. He attended Brookdale Community College, and has worked at Kelly’s Tavern in Neptune for five years as a bartender and waiter. Riley grew up in Ponchatoula, La., where he attended Ponchatoula High School. He moved to Lafayette, La., to attend college. He worked at Drude’s Ar and Heating, then moved to Birmingham, Ala., in early 2015. He worked at Gruendler Services while attending NARS where he earned his air and heating diploma. He also worked for Cindy Wade of LAH Real Estate and Brian Faught. Riely has always been an enthusiast of camping out doors, and he fell in love with hiking while living in Birmingham. They have been on the road since early Septmeber. There were a few early perils … camping too close to an ant hill resulted in having to spend a full day, and quite a few bucks, washing down everything they had. They fortunately skirted Hurricane Matthew. But they are seeing some beautiful scenery. They are relying on the kindness of both friends and strangers in this journey. Devin Gagliardi, 27, of Flint, Mich., walked with the two for several miles. Others also joined them on at various times. Along the route, strangers who recognize a few guys hiking along the ADT will pass them a meal voucher for a local restaurant or hand them food; one day a local resident handed them a box with peanut butter, hummus, bananas, apples, crackers, cookies. A few times, the boys have been invited to make camp in some local residents’ yards. They had a family who let them set their tent up out back, then treated the boys to beers and burgers. A week later, a pastor and his wife invited them to camp out back and brought out meatball and sausage sandwiches. When they can, they post up pictures on their Facebook page, The Odyssey of Biscuit and Greenbeans. They also post up pictures of themselves with some of the people who have met and helped or inspired them along the way. The boys have a long road to haul. If anybody would like to help them along, buy them a meal, or send them a few bucks to replenish the food and cooking equipment that they carry, there’s a new account set up on GoFundMe under the Odyssey of Biscuit and Green Beans.